Can You Change Your Story? Who will red line the story of your life? I write a story and give it to the editor. The story comes from my research, my experience, and my imagination—I can give it life, I can paint pictures in it, I can give it cadence or flow so that it sound almost like a song when read out loud. 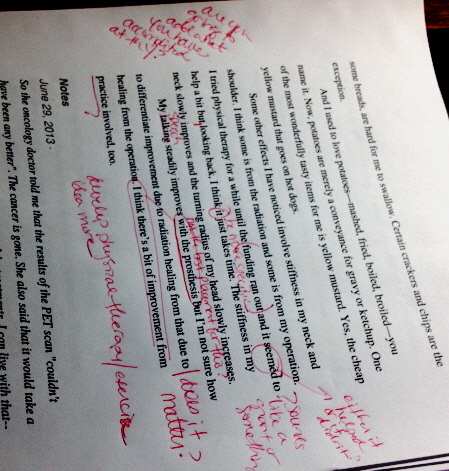 And then the editor goes over it and makes changes. Changes are discussed and corrections are made. The story gets better. This doesn’t happen in my life, though. I cannot go back and make changes. I cannot be sure of the future story and I can only make changes in it before they happen. All I have for editing my life’s story is now. I get one shot at it and there are no red pencils that will mark the mistakes. I can develop a better plot for the future, but things may change, and what I expected may not be. All I can really change is how I feel about things, and how I view my past, present, and perceived future. I can control my attitude. Previous And It’s All So Easy!… Next Will You Find Magic Today?